Can America fill the fan-tastic appetite for branded team sports gear? 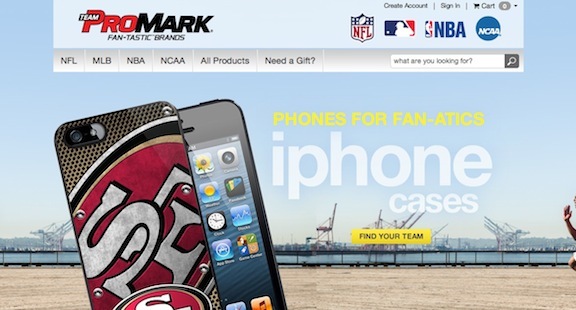 Fans will find over 2,500 product SKUs from the newly branded website of Team ProMark of Longmont, Colo. This site showcases officially licensed products from the NFL, MLB, NBA and NCAA in the Tailgating, Homegating and Electronic-Personal Device Case categories. Team ProMark also sells to major retailers and wholesalers nationwide. Designed by The Creative Alliance, the new ecommerce site allows fans to buy everything from phone cases and sunshades, to auto emblems and door banners. “With over 2,500 unique products from four of the top sports brands in the world, this was a complex site that required a great attention to detail,” said Jodee Goodwin, who spearheaded the project for TCA. “This site does a great job of promoting Team ProMark’s ‘Fan-Tastic Brands’ image, while bringing cool branded team products to a expanding consumer fan base,” said Bill Skinner, Team ProMark’s President.